I don’t know what got into me when I offered to give a pound of chanterelles to all the friends who would help me with a pledge for The Run For The Cure, coming up October 2nd. But It is on paper and I have to honor the promise, so today I spent two hours gallivanting in my wool socks and hiking boots through difficult terrain at my secret spot searching through the moss for the early specimen of chanterelles, and it was hot, and the mosquitoes were biting. Thank God, Jules the Jack Russell located a few patches. With Dunnery’s help, I hauled in 3 kg of premium chanterelles, those that have not been touched by rain and are the tastiest. Not too many of those on Vancouver Island. The secret spot is so remote that there is no food available for miles and I had to bring a decent picnic to motivate the pickers. Since this was all planned, I had roasted a stuffed loin of pork last night that I just had to slice today to eat cold in the woods. 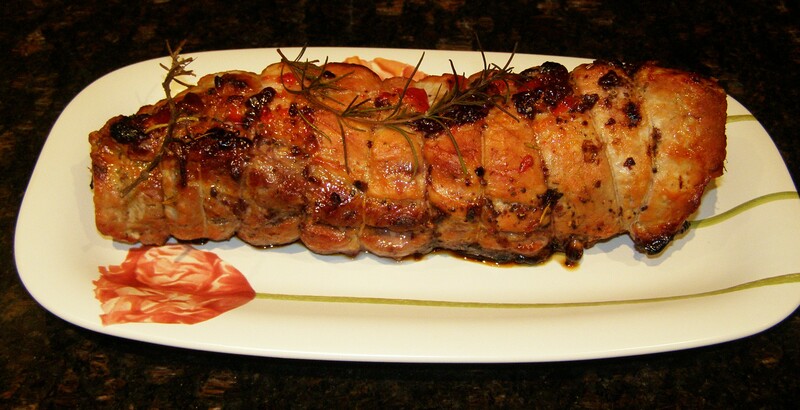 Stuffed Pork loin Roast: I started with a fairly large loin, about 3 kg and cut it in half as I don’t own a dish long enough to roast that in one piece. I saved half and started by spreading the roast I was going to stuff on a good board, then sharpening a good knife almost like a filet knife. The key to the stuffing staying in and looking good is the cutting of the meat. So I started by cutting through the length of the roast , not in the middle but at about 1/3 of the thickness. You stop before cutting the roast in half, then open the top flap and keep doing further lengthwise cuts and pull open, so that the result looks like one large flat rectangle of meat. If it is not even , it does not matter. It is almost as if you were undoing a Swiss roll jelly cake with a knife. You could not rotate the knife in the jelly groove, so you would insert and open and again. All the hard work is done now, you just have to spread a filling of your choice on the meat. I used a mix of Kalamata olives, zest of half a lemon, 2 tbsp sage, 1 tbsp rosemary leaves, 2 tbsp olive oil, salt and pepper all ground together in the food processor and mixed with 2 tbsp of hot pepper jelly. The hot pepper is nice, but next time I will replace it with grainy mustard. Also, next time, I will try stuffing with chanterelles and tomatoes, parsley and garlic. The next trick is to roll the roast with the stuffing trapped inside. Because you are actually rolling the roast together and not just shutting it down (if you had just cut in the middle like in a butterfly cut), the stuffing does not really leak. You need twine though. Cut about 3 feet off so you do not contaminate the rest. Tie the first knot at one end of the roast but do not cut the twine, keep going like a seamstress, make the next loop and pull the thread under it before you go to do the next loop. It is neat and pretty. 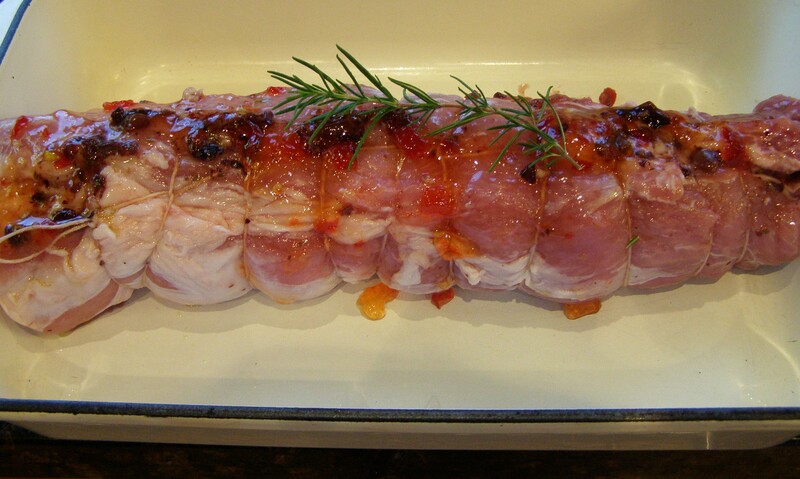 Decorate with a drizzle of olive oil and a sprig of rosemary, roast at 360 for 55 minutes. 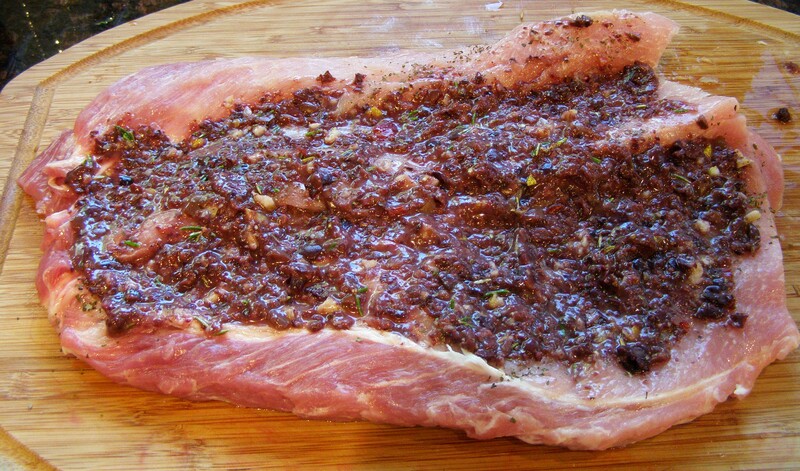 Cool down, wrap and refrigerate overnight, cut thin slices the next day and eat with a dash of mustard. And do remove the strings before serving, oops! Thick slices to serve hot in picture or thin to serve cold. 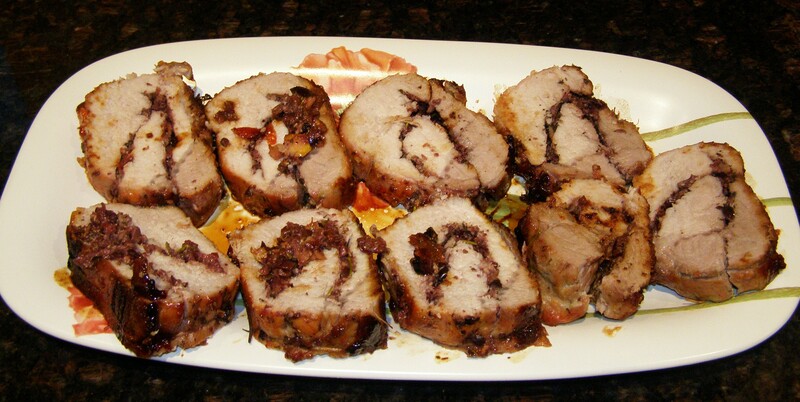 This entry was posted in Lunch and tagged chanterelles, food, pork loin roast, recipe, recipes, run for the cure, stuffed pork loin, stuffing pork, verygoodrecipe. Bookmark the permalink. 2 Responses to Stuff the pork loin to take on a picnic! And you may add mushrooms sauteed first. Hi Cooking Frog, I wanted to make some pate for some reason and couldn’t find a recipe at “the frog”, is it called something else? I was thinking of a simple chicken liver pate with onions, maybe mushrooms, garlic etc…any suggestions?